Mike Hopp, the owner and brewer at Bombing Range Brewing Company, pours a sample glass of beer. A seemingly unlikely partnership between Washington State University Tri‑Cities and a local brewing company has led to a range of support for student military veterans. Last year, Bernadette Gagnier, a WSU Tri‑Cities wine science student representing the university’s Patriot’s Club, which comprises largely student military veteran, approached Bombing Range Brewing Company to see if they would be willing to work with the club to produce a beer that would highlight veterans and their service. The company partnered with the student group to produce an India pale ale, named GIPA, that is dedicated to those who have served. The WSU Tri‑Cities student veterans participated actively in the beer brewing process, preparing the brew, adding the hops and stirring and preparing the mixture. Upon release, the beer was incredibly well received. The seven barrels, or 210 gallons, of the GIPA sold out within two weeks of production. The company also sold shirts as a tribute to the special brew. 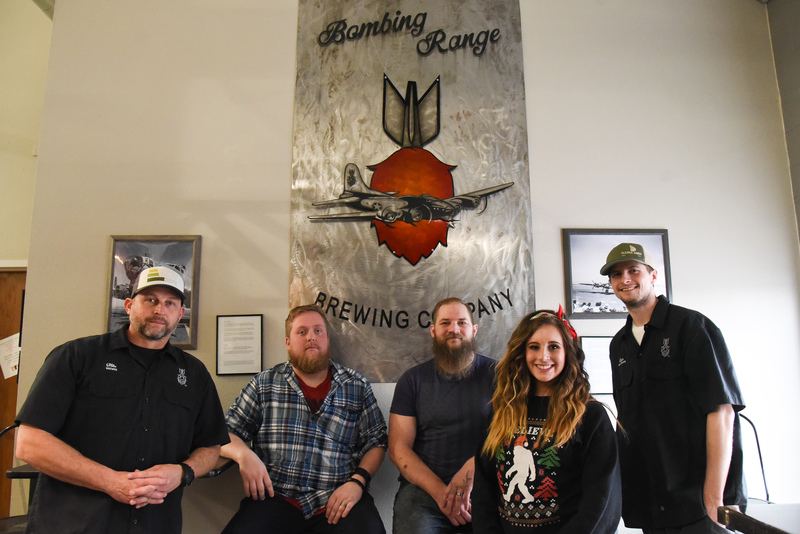 “It’s great to be able to contribute back to this population of individuals who have given so much of themselves,” said Mike Hopp, owner and brewer at Bombing Range Brewing Company. “It’s been a great partnership and a great collaboration of people. Last May, Richland Rotary presented a growler and shirt with the branding of the GIPA to former U.S. Secretary of the Defense James Mattis (a former Tri‑Citian), on behalf of the student veterans at WSU Tri‑Cities during the Tri‑Citian of the Year awards presentation. The effort proved to be one of the greatest moments of Gagnier’s life, who was in attendance at the event. As a result of the partnership, Bombing Range has donated more than $1,000 to the WSU Tri‑Cities Veterans Center that contributes to services support for student veterans at the university. The group now plans to continue the partnership for the foreseeable future, with brewing opportunities to take place twice a year. The company also plans to continue to donate funds to the student veterans organization each year. Hopp said he and his son, assistant brewer and manager Ryan Young, thoroughly enjoyed the partnership with the WSU Tri‑Cities veteran organizations. “It’s been fun,” Hopp said. “We’ve had the chance to work with good, quality people, and we’ve had to opportunity to give back in the process. 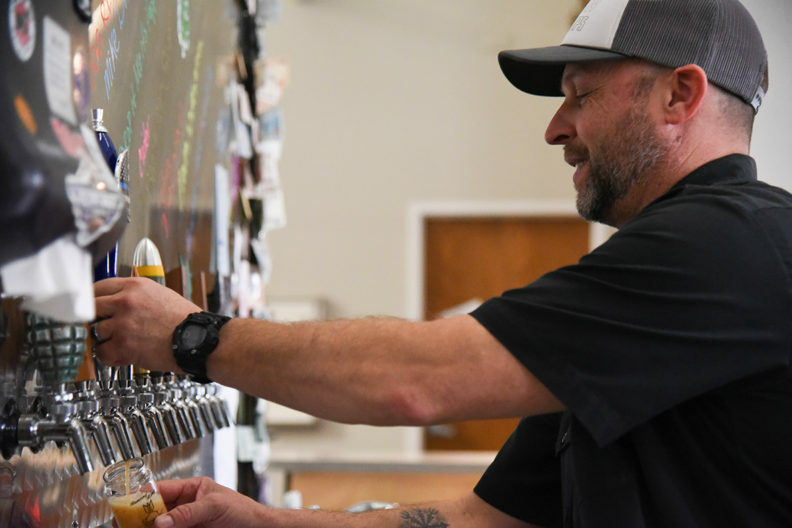 Hopp said they have known WSU Wine Science Director Thomas Henick‑Kling for some time and have wanted to collaborate with WSU Tri‑Cities in some way, and also have wanted to do a beer dedicated specifically to veterans and first‑responders. Being able to work with student veterans, he said, has been extra special. Gagnier initially approached the brewery about working with the Patriot’s Club thinking that it would not only provide a great bonding opportunity for the student veterans, but would also allow them to learn a new skill. The match proved a perfect fit. Being a viticulture and enology student, Gagnier said there are a variety of methods and skills she saw and demonstrated through the brewing process that were either similar or could possibly be replicated in winemaking as a trial or the same process. For other nonwine science majors, the opportunity provided a great stress reliever among their mix of classes during the school year. Zachary Hays, a senior engineering major, said he and his fellow student veterans enjoy the leisure of the activity, learning a new skill, as well as contributing to a local business. The student veterans teamed up with Bombing Range Brewing Company again this winter to produce another brew — this time a Lou Dog Red Ale. This spring, the duo will work once again to produce their second round of their GIPA. The group will get together in March to produce the beer and then will have a release party, which is open to the general public on April 13. The time of the event will be announced soon. Gagniner said she is excited for the partnership to continue. Bernadette Gagnier, a WSU Tri‑Cities wine science student, poses with the staff from Bombing Range Brewing Company.